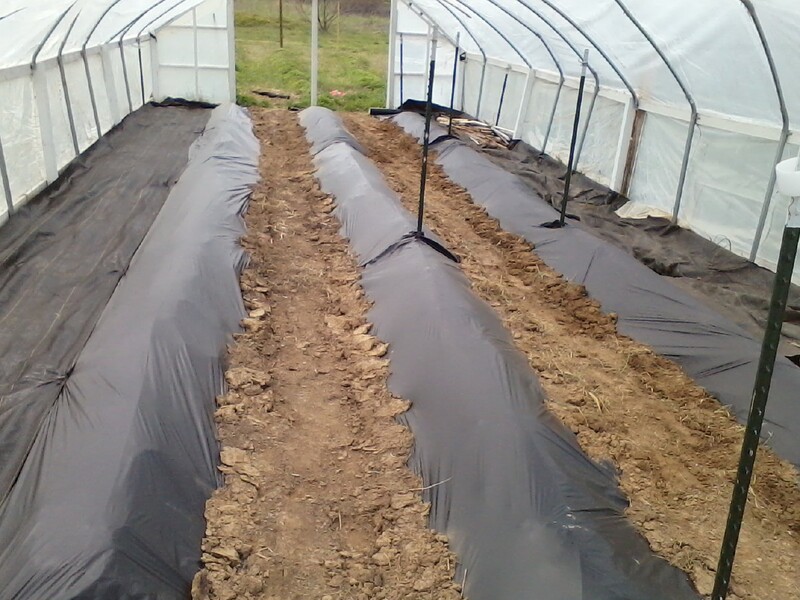 I finally got my high tunnel planted today. It's 18 1/2' by 48'. With about three feet to walk around the end of each row, I'd guess each row to be 42 feet. I just counted my list below, and there are 60 plants. 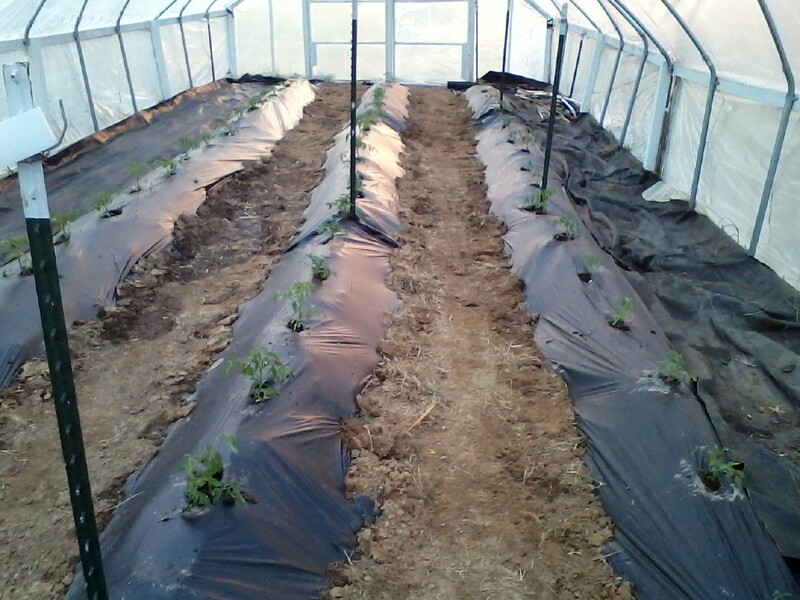 The high tunnel puts me about 30 days ahead of the outside gardens. 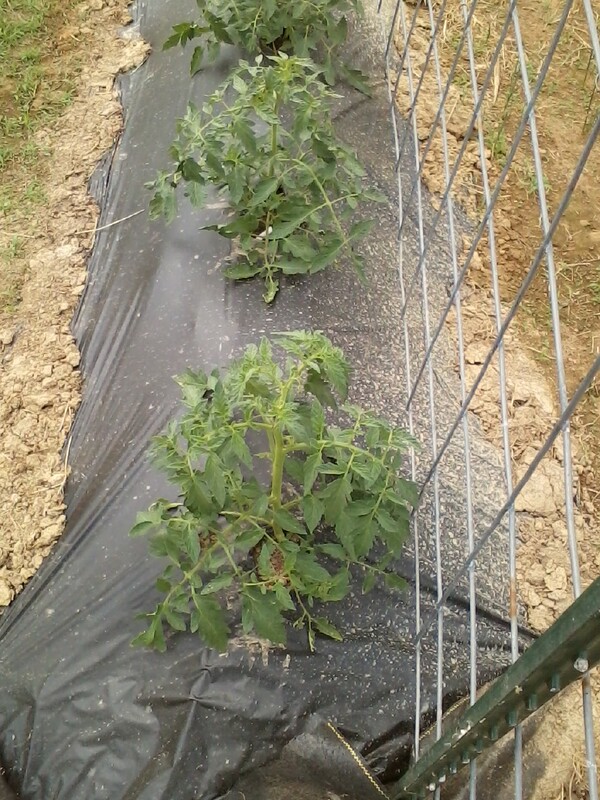 I will have tomatoes for the market in June, before everyone's garden tomatoes ripen in July. 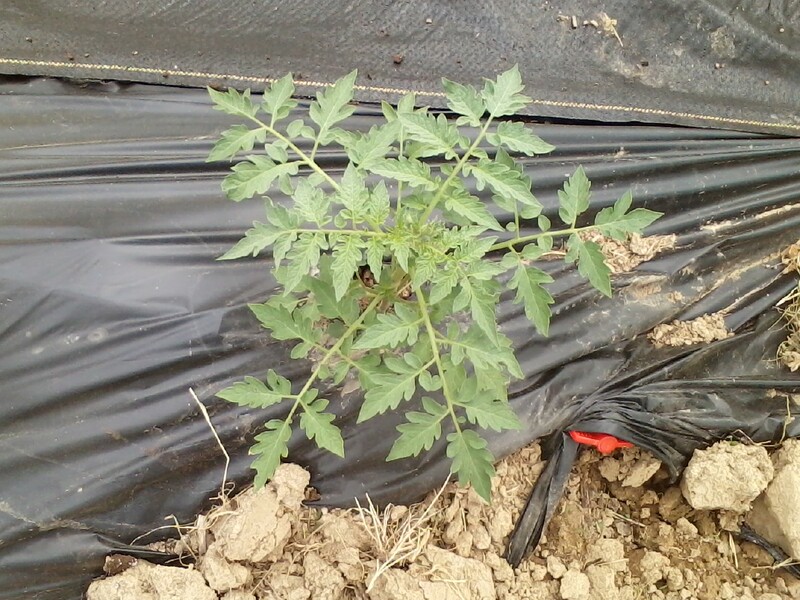 I found a 4-pound bag of Tomatotone and about half a pound of greensand. I spread that over the three rows. It's a ridiculously small amount of fertilizer. I may feed through the drip irrigation later. 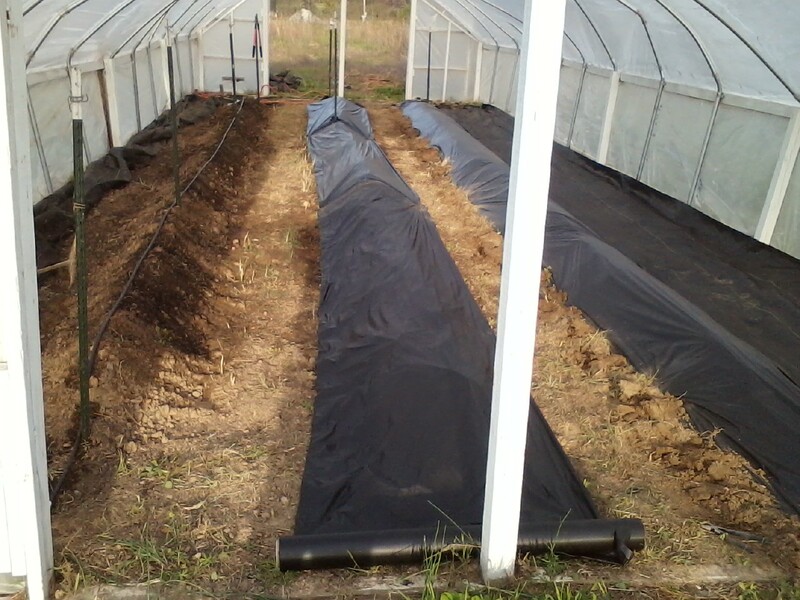 I mounded the beds back up with a hoe; that buried the fertilizer a little. Here is the variety list. The number in parenthesis is the number of plants of that variety, if more than one. Some names are the English translation with the Russian listed next to it. Cosmonaut Volkov and Titan Red came from my own saved seeds. Everything else was from swaps and trades. Thank you to all the people who traded with me and participated in the swaps. Good start Cole. Hope things grow well for you this season. Looks good Cole. Lots of room and interesting varieties. Great list, hope to sample some of the Russian varieties in your offer next year. Does the Cosmonaut Volkov grow short and stocky for you? How was the fruit size and shape. Seems to be a lot of variation in the variety, but everyone says the taste is good to excellent. I'm growing it this year from MMMM seed and will have at least a couple going to replace the Big Beef that was dropped completely. Your suggestion on that. Thanks guys. I had actually planned to grow a few expensive hybrids and Taxi, but those plants got sick from the cold in the greenhouse. Except for Titan Red, these are all substitutions. 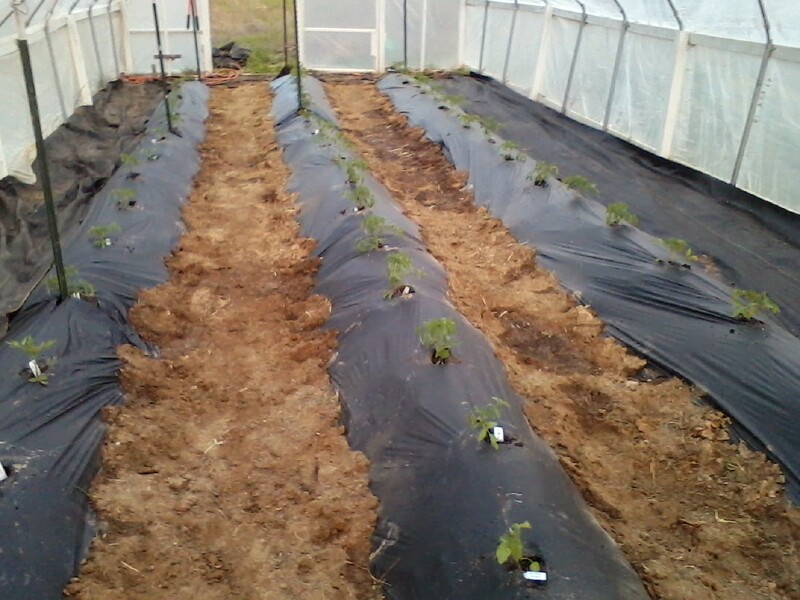 If I only cared about making money, I would only grow Titan Red and Taxi in the high tunnel, but maybe some of this year's challengers will be even better. I'm eager to see how Sol Gold compares to Taxi. I'm guessing better flavor, but lower yield; we'll see how much lower. Cosmonaut Volkov vs Tarasenko 6 will be an interesting versus challenge as well. I have to admit, it was fun shopping for plants in my own greenhouse, next door to the high tunnel, with a couple thousand plants and 100+ varieties. Cosmonaut Volkov should grow a large, indeterminate plant. The fruit looked just like Big Beef; they weren't catfaced or irregular at all. The plants are taking off. They're twice the size in a week and starting to bloom. That is, except for Gloria, and 2 of my Black Amber. I think stem rot got them. They were replaced with an Agatha, a Shadow Boxing, and a Hazelfield Farm Red. My other Black Amber looks great; I'm looking forward to it. Sorry to hear the hybrid showdown fizzled out. Cole or Gerardo, do u guys notice how tall the GWR type dwarfs get compared to other dwarfs? They are for me significantly. Beryl beauty and golden gypsy. Almost look like they want to keep going up and not throw out and side branches. I really am not a fan of their growth habit thus far, but suspect all will be well in the end. Edit: obviously golden gypsy is not a GWR. Also, I think my wild Spudleaf are unstable. Not stocky at all and are tall like indeterminates. Last edited by PureHarvest; April 25, 2016 at 08:32 AM. I've got Shamrock and Emerald Giant, the first is pretty large and in charge, the 2nd is on its way there. Unless you know the growth habit already, it's hard to guess how they will do next to each other. I put a Bushy Chab in the same container as a Tasm Choc. It worked out well, one took the high road and one the low. Perhaps a very short one and a "larger"one can be the way to go for the two in a bag experiment. Jade Beauty is the GWR dwarf I grew last year. It was about the same size as my other dwarfs. I agree with Gerardo; you don't know a variety until you grow it. I'm comparing them right now as seedlings in 3.5" deep pots as I'm getting ready to put them in bags. So to look over the trays, it's interesting to see the growth habit of the 9 different dwarfs I have. They all look awesome to the point that I don't know that I can tab a favorite at this stage. Maybe a lean to wild Fred right now. 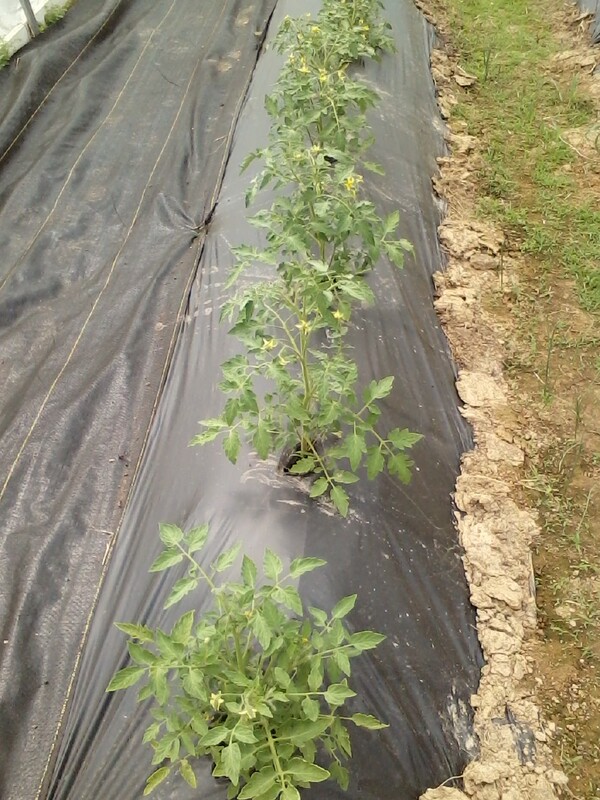 I have decided to do 2 bags that will get one plant each and 2 bags that will get 2 plants each. Replicated over 9 dwarf varieties. Decided to do no pruning on any of them. Wild Fred is a cool one. Fred's Tie Dye is similar, in habit at least. Sugar's magic is having a Rob Ford effect on Black Amber. They sure look happy.